Waikato River is the longest and greatest river in New Zealand. 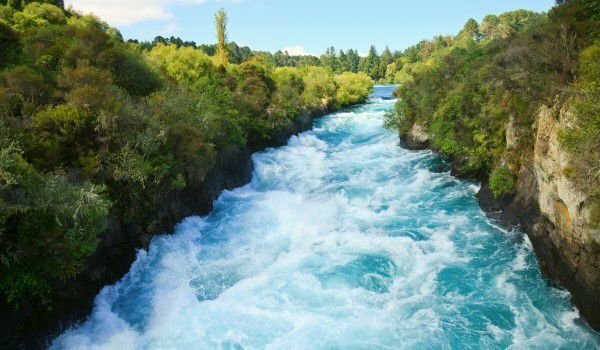 It flows through the central North Island and its flow creates amazing natural attractions such as Huka Falls. The name comes from the Maori language and translates as "flowing water". For centuries, the river has had special spiritual significance to local Maori tribes. For the people Tainui, Waikato is a source of tribal pride and prestige. For most people, today the river is mostly a tourist attraction, where you may cast a hook. The length along the Waikato amounts to 425 km. In principle, the beginning of the river is considered the largest Lake in New Zealand- Taupo, but geographically Waikato stems from the eastern slopes of Mount Ruapehu in Tongariro National Park, joins the Tongariro River system, whereby it heads north and empties into Lake Taupo. Waikato drains freshwater from the lake’s northeast side and heads southwest, to the Tasman Sea Tasman Sea, south of Auckland. In its downstream, Waikato forms many beautiful lakes and lagoons. The main tributaries of the river are Waipa and Poutu. The largest and most important cities through which the biggest river in New Zealand flow are, Rotorua, Cambridge and Hamilton. Eight power plants were built between Waikato, Taupo and Karapiro, they are a major source of electricity for the region. Y these stations are located artificial lakes that are popular for tourism and recreation. During 1863-1865, the river was the scene of numerous battles and skirmishes between the British and the local Maori tribes. Today environmental problems along the river are small, considering that it takes waste water from eight smaller cities and the large center of Hamilton. Over 10 industrial sectors dispose waste water into the flow of the Waikato, as the river water is used for irrigation of farms along its coast, and it is used for providing drinking water for over 140 000 people. The Waikato is fundamental to the people of Tainui tribe. They used the water for irrigation and food from the time of their migration in the region. The river has a sacred significance for their history, culture and lifestyle and now the tribe leads lawsuits against the polluters of the river. The stream of Waikato is a popular place for recreation and tourism. North of Lake Taupo is located the Full James rapid, which has held in the past a big kayak race. Waikato is a good place for hunting, as punters get to exercise their abilities and sight with ducks. Another popular place for kayaking is an artificial lake at Karapiro. Along the Waikato were also built excellent routes for cycling.